Comprised of entrepreneurs, doctors, lawyers, architects, engineers, artists, and poets, the Kafie family is said to be among the oldest, most talented families in the country of Honduras. One such member, Dr. Gaby Kafie, returned to his family's roots after operating as a physician in Miami for over a decade. After losing his vision due to a rare ocular disease, Dr. Kafie turned to his lifelong passion of cigars, opening the Tabacalera G. Kafie y Cia factory in his homeland of Honduras. While Kafie 1901 Cigars primarily focuses on premium, boutique-minded smoking experiences with a deep respect for the Kafie family's Honduran ancestry, the factory is also known for its "factory direct" bundles. Liga de la Casa (formerly known as Kafie 1901 premium bundle) is a Spanish term used to describe the factory's "house blend;" the cigars boast premium-grade fillers from Nicaragua and Honduras, a Honduran binder, and wrapper varietals of either Ecuadorian Habano or Mexican San Andrés maduro. 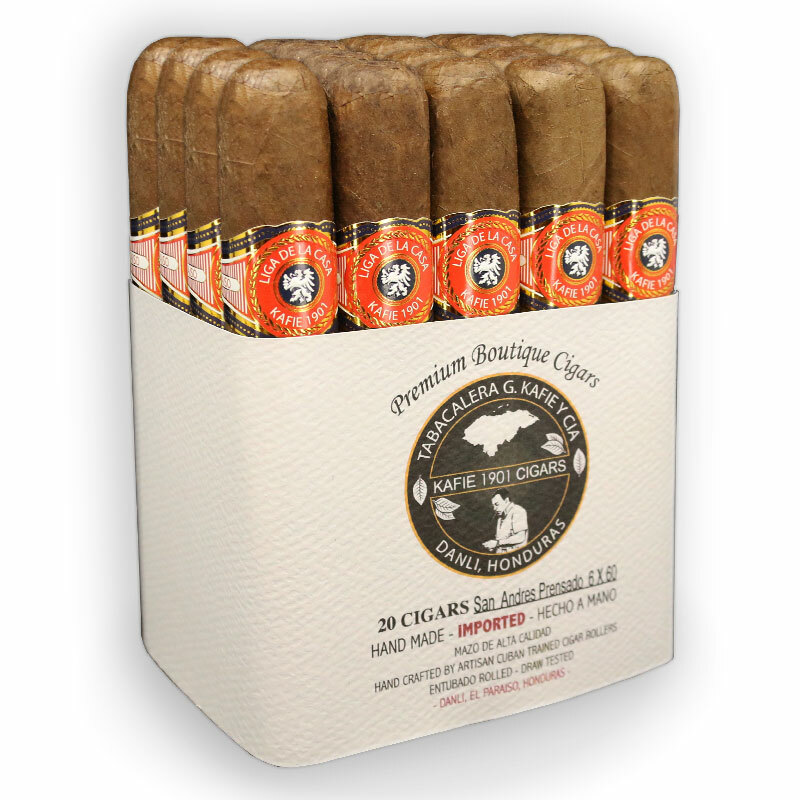 Liga de la Casa Ecuador Habano Natural offers a medium body and classic, dependable flavors of cedar, earth, leather, and a beautiful natural tobacco sweetness. For the Liga de la Casa Mexican San Andrés Maduro, the blend is slightly stronger, giving a medium-full body and darker nuances of cocoa, earth, mocha, and aromatic spices through the nostrils. Both cigars are stripped of decorative packaging, allowing consumers a premium smoking experience at an unusually affordable price.